Everybody has the potential to use psychic abilities because everybody possesses the ability to do so whether they know it or not. Your spiritual skills simply need to be trained and developed in order for you to truly connect with your intuition and allow your psychic abilities to become apparent. There are certain techniques that you can use to practice and sharpen your intuition and deepen your connection with your spiritual abilities. 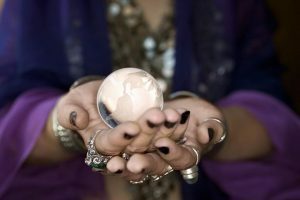 While these are suggested ways to help bring out your psychic abilities to those who are new to them, these methods are also very useful for experienced psychics to practice and to enhance their abilities as well. 1.1 1. Believe that you can do it. 1.2 2. Meditate once a day (at least). 1.3 3. Practice feeling the energy of certain objects. 1.4 4. Allow yourself to forgive and forget. 1.5 5. Practice active mindfulness meditation. 1.6 6. Learn how to face your fears. 1.7 7. Connect with your spirit guide. 1.8 8. Ask your spirit guide questions. 1.9 9. Practice the psychic skill of seeing auras. 1.10 10. Maintain a dream journal. 1.11 11. Try taking a spiritual development class. 1. Believe that you can do it. Your psychic potential is incredibly reliant on the faith that you have in yourself. Accept that it may take some time, but eventually, you will be able to access your psychic abilities whenever you like. Ask any psychics you know about how they were able to hone their gifts, and what advice they may have for you. Learning from others is a great way to find out different methods for practicing your psychic development. Train yourself to stop ignoring your intuition, and put all of your efforts into this venture. 2. Meditate once a day (at least). Use this as an opportunity to reach a state of deep relaxation each day for at least 10-15 minutes. Meditation helps you connect more with your spiritual self and become more in tune with the energy of those around you. If you are new to meditation, here are some simple steps to take to slip into a relaxed meditation. First, find a peaceful environment free of any external distractions like a television or your cell phone, and only play calming music. Next, make sure you are wearing comfortable clothing. You don’t want to be focused on how restrictive your clothing feels when you are trying to clear your mind of external factors. Before you actually begin meditating, stretch out your body. Minimizing any tension beforehand will help you further relax. When you are ready, assume your most comfortable meditation position and close your eyes, beginning with following your breathing and eventually practicing visualization. 3. Practice feeling the energy of certain objects. Touching an object to read the energy of it is called psychometry. This is a great way to flex your intuition and begin developing your psychic abilities. Objects that work well with this practice are stones, rings, and crystals. Stones and crystals, in particular, contain strong energy. Begin with objects that are about the size of your hand (or smaller). Jewelry, for example, and other metal objects tend to hold onto energy well. Take deep breaths and allow the energy to begin flowing through you. A tingling feeling in your hands is perfectly normal. With the object in your hands, close your eyes. Focus on how your body feels, listen to what your intuition is telling you. 4. Allow yourself to forgive and forget. It is imperative to find inner peace with yourself in order to hone your psychic powers, and part of achieving peace within yourself is resolving any feuds between yourself and the people around you. You should practice resolving conflicts efficiently and mostly avoiding conflict altogether. If a conflict should present itself, you should always be thinking a peaceful resolution. Anger will only hinder your spiritual energy. Releasing all of this anger and negative energy will allow you to relax into meditation much easier and faster as well. 5. Practice active mindfulness meditation. Meditation is not restricted to a sitting-in-place practice. Another great way to relax your mind and strengthen your intuition is to take a walk outside to absorb the natural energy. You can simply walk and allow your mind to settle, or you can actively concentrate on each step you take as you walk. By focusing on the movement of your body, you will find your mind releasing itself of anything that might be littering your thoughts and holding your energy back. Walking is a very meditative experience. 6. Learn how to face your fears. Psychic abilities are neither good nor bad. Supernatural energy and psychic energy can be alarming, but your fear will hold you back more than negative energy ever could. When you decide to unlock your psychic ability, you are accepting all the outcomes and consequences that might come with it. Once you have further developed your skills, you might find yourself foreseeing events at unexpected times. You need to accept and welcome every gift that your spirituality brings you and let go of any worries holding you back in order to connect with your Higher Self. 7. Connect with your spirit guide. Your spirit guide is picked out just for you, giving the two of you a very deep connection even just starting out. Their job is to guide you in your life journeys and spiritual growth. You can have more than one spirit guide within your inner circle, and their combined wisdom and experience will benefit you in your spiritual journeys. Your spirit guide is always at the ready to connect with you, but slipping into the proper mindset required to contact them is tricky at first. You will need to devote some of your regular meditation sessions simply focusing on striking the initial contact with your spirit guide. After your first connection, finding them again will become easier. What does my spirit guide look like? What is my spirit guide’s name? What is my spirit guide’s personality like? 8. Ask your spirit guide questions. Your spirit guide is there to help you with anything you need, so, by all means, turn to them for guidance. A spirit guide’s abilities range from mending deep emotional scars to locating a lost item and everything in between. While your spirit guide is ready to support and guide you, you must make sure you are asking your spirit guide clear questions without being attached to the outcome. Try asking your spirit guide for a sign. Start by choosing a specific object to receive that will serve as the connection of communication between you and your guides. Consider each of your guides’ specific specialties and areas of experience. If you are looking for guidance with your music, ask a guide that has written music themselves for guidance. 9. Practice the psychic skill of seeing auras. The aura around a person is how their energy from the vibrations of their spirit appears. To see these auras, you just need to develop the skill over time with practice. The first step is to be able to see your own aura. Start by sitting in front of a white wall. Your feet should be against the ground and you should be focusing on your breathing to slip into a state of relaxation. With your palm towards the wall, extend one arm in the direction of the wall. Relax your stare, softening you gaze while looking at your hand. Staring with this relaxed gaze, wait about 30 seconds to a minute and you should begin to see a field of energy forming around your hand. Begin to space out your fingers, focusing on the space you’ve created. Eventually, you will be able to see the outline of your aura around each finger. With even more time and practice you will be able to distinguish the different colors. Patience and calm observance are all it takes to master this skill (and all the time it takes to practice). In time, you will be able to see auras without the white backdrop. 10. Maintain a dream journal. When you are first beginning to develop your psychic skills, your previously repressed psychic abilities may begin to reveal themselves in detailed dreams. This is because your spirit energy is not repressed by your conscious mind when you are asleep, allowing your spirituality to begin growing in your unconscious mind. An old dream journal is also very nice to look back on as evidence of your spiritual journey. 11. Try taking a spiritual development class. While taking a class is not necessary to tap into your natural psychic ability, a class environment can create a space that makes you feel safe and close to those around you. This relaxing and accepting environment is optimal for guiding your spiritual energy and becoming more in tune with your intuition.